Gregory L. Norris takes the reader on a twisted journey through his dark imagination. He shows them things that lurk in the deepest, more horrifying parts of his mind…where few would dare go.The Fierce and Unforgiving Muse is a collection of 26 novellas and short stories.Story One: Storage – When a man is forced by his life circumstances to store his possessions in a unit for a while, until he finds a new place to live, he’s discouraged when he finally retrieves them. Some of them are severely damaged…and smell. He finds out the hard way what’s been lurking in the boxes, waiting to devour what it wants.Story Two: Dust to Dust – When the dead rise up and attack the living in ancient Egypt, they’re confused at the cause. They battle to survive, while they struggle with their beliefs and political ties.Story Three: Nightmare Near Highway 101 – Madison struggles with nightmares of what his father did to him when he was young, while trying to survive as a college dropout. He gets into some trouble, and his brother comes to the rescue. Madison has to go home, and he’s not looking forward to it. He finds out his father is dead, and that helps with his inward struggle. But, when he and his brother are kidnapped on their way home, things go from deadly to confusing.Story Four: The Enclave – A young boy lives in a secluded, mysterious neighborhood. Those who live around him keep disappearing…and he knows it has something to do with the strange beings in the woods and the UFOs. Life goes on and on for him and he finds out that he’s special, and that’s why he remains, alone.Story Five: Norman – A notorious violent gangster has a special friend…one that haunts him from the corner of his eye and frightens him. He makes a friend that explains where his scary companion comes from – it’s an ancient entity that has attached itself to him because of his evil deeds. There’s no way for him to shake the creature. He is powerless and a slave to its will.Story Six: The Dead Car Smell – Ray starts a new job as a used car salesman. He hopes that the commissions he makes will mean good things for him and his son, who are struggling to get by. The dealership has a secret that Ray can’t let go – he has to find out what’s going on beyond the rusted fence that surrounds a small lot out back. But, his curiosity is his undoing. He finds out what he wants to know, but it doesn’t bode well for the future he was hoping for.Story Seven: Grand Theater – A couple (an author and a stage designer) escape from the big city to a quiet estate in the country when their health suffers from stress. They’re happy with their new lives, but someone from the past comes to visit, wanting the stage designer to come back and do another job…and they won’t take no for an answer. Through deception and greed, the couple is torn apart by the plot set in place to lure them back to their old lives.Story Eight: The Evil One – A young man moves in next door to a family with two girls and a father. The father knows the young man is evil – he can tell. However his oldest daughter hooks up with him, and no matter what the father does, he can’t make her see reason or seem to scare off the young man. He ends up losing his daughter in a wreck and he blames the young man who was driving. Everyone thinks he’s crazy. The young man turns his attention to the younger daughter and the father fights tooth and nail in an effort to save her.Story Nine: Unreal Estate – A man is approached by a woman who has an outlandish story to tell him. She wants to enlist his help. In another dimension, things are happening to enslave their current reality. He doesn’t believe her at first, but then he sees the signs. He has to choose whether he wants to be a slave or if he’ll be willing to risk his life to help save everyone else.Story Ten: The Menagerie – A man’s father dies. The father always had a lot of different…hobbies. What the son finds out about his father and some of his hobbies and past exploits shocks him.Story Eleven: Jumping Beans – A man is having issues with his teeth rotting away – his mouth is a bloody cesspool. In a fit of rage, he heads to his childhood dentist office to confront the dentist who put filling in his teeth years before. He finds the dentist’s son now runs the practice. But, once he’s in the chair, he finds out the truths of the past and the present.Story Twelve: Hollyhocks in the Vacant Lot – A young boy who lives with his grandmother is lured into an old vacant lot by large, beautiful flowers. He plans to pick some for her. Once there, he finds himself face to face with an ancient evil… The nightmare begins.Story Thirteen: The Pandemned – The world is devastated by a plague that wipes out most of the population. Those who survive have a hard time not starving. Finally, they manage to have some semblance of civilization, but it’s still…strained. There is a murder outside the city, where a land owner has farm plots and pays little to his workers. When the police go to investigate, they’re hindered. One officer knows who the killer is, and she risks her life and safety to find him in no-man’s-land.Story Fourteen: The Cycle – A woman seeks an apartment after a break up half the country away. She finds herself at an old house that had been renovated into apartments. They don’t want to rent to her because she’s a single woman. She convinces them to. Soon, she finds out why they didn’t want to rent to her, and she fears she might have made a mistake. From an elderly woman who had once lived in the apartment, she finds out about it’s horrible past and tries to take control.Story Fifteen: The Tora Bora Horror – During a mission in Afghanistan a military exploration uncovers an ancient evil that has been unleashed from the depths of the Earth through bombing.Story Sixteen: Grinn – A romance author is hounded by “haters.” One of them sends her a Christmas present of a doll. She throws it away and tries to figure out which one of her nonfans sent it. The present doesn’t stay in the trash, but rises up and tries to kill her in her remote home, during a snow storm.Story Seventeen: Cry in the Night – A convoy of soldiers in lost. They move forward to attempt to find their target location for their mission. During their travels, they come across some of their enemies and strange prisoners in the woods. They take them all down and continue on with many questions. They come across a prison camp and find out more than they wanted to know…but not in time.Story Eighteen: The Laying-On of Hands – A young pregnant woman is freaked out by older women who keep coming up to her and putting their hands on her bulging belly. It happens multiple times and she thinks she’s going into labor after more than one incident.Story Nineteen: The Ape God – Trapped in a country in the grips of a civil war, a researcher tries to save the gorillas he knows to be in danger from both sides of the battle. He and his associates travel higher and higher into the mountains while being hunted. They find an oasis unlike anything they’ve ever seen before.Story Twenty: Alms for the Dead – A girl who lives in the shadow of a castle fears what used to live there. When the family that dwelled in the castle returns suddenly, her world is turned upside down. She remembers the disappearance of her sister, and is curious as to what the new arrivals mean. She finds out in the woods where she’s forbidden to go.Story Twenty-One: The Green Dream – An artist is stuck in a beige world with his girlfriend; she’s carrying his child and they have little money. An artist friend of his teaches him how to expand his mind and travel to a world of color and light, but it becomes too dangerous for him to go there any longer after a betrayal.Story Twenty-Two: Jason and the Zombonauts – A gang of thugs are attacked by a rival gang on their home turf. Something is wrong with the – all they want to do is bite. After they’re bitten, they become…different. But that doesn’t stop them from traveling across town to exact revenge.Story Twenty-Three: Satyre – A chef notices that food is going missing from his kitchen overnight, while his restaurant is closed. He makes plans and sneaks back in after hours to discover the culprit. They are nothing near what he expected.Story Twenty-Four: Clowniwowns – A single mother and single father meet at a child’s birthday party and fall in love. He tells her of his past, that he used to have a twin. When her curiosity gets the best of her, she strays into the attic of his house, where he told her she shouldn’t go. What she finds there unnerves her.Story Twenty-Five: Veneer – A man away on business starts to doubt his reality, and makes a snap decision.Story Twenty-Six: Brood Swamp – A woman is murdered in her home and a special investigator is called in to help find out who did it. They suspect the husband, because he was not a gentle man with his wife, but they find out they were wrong and there is more evil at work than they knew.Each and every story in this collection is different and creative. Even if I didn’t love every story, I still enjoyed reading them all for their creativity and diversity. I didn’t like some of the endings, because they were too wide open, but that’s a personal preference, I think. There are mistakes with punctuation, spelling, and extra/missing words throughout, but there aren’t enough to ruin the book for anyone.Note: This book has a mixture of sexual orientations in the characters. 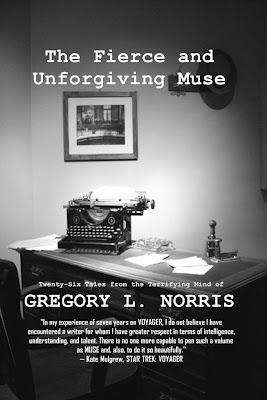 Reader Caution: “The Fierce and Unforgiving Muse” is a glorious romp through the creative fields of imagination of multi-published author Gregory L. Norris. However-this is not a short novel to be raced through at the speed of light. This is a story collection to be savoured. It has become trite to specify, “something here for everyone,” yet I say it because I believe it to be true. Any reader who doesn’t find something (or multiple somethings) delectably scary, tantalizing, and horrendous here-is a very jaded reader. Contemporary and historical, social issues or personal trauma, even the extraterrestrial. As I said: something for all. Among my personal first-read favourites were “Dust to Dust,” a narration set in Ancient Egypt; and “Nightmare Near Highway 101,” which has one of the most unutterably terrifying epigrams I’ve ever encountered. But you’ll have your own favourites, these or something else. All readers of this volume will. Just remember what I’ve told you: don’t rush, don’t race (except to buy this collection). This is the kind of set that deserves your reader attention, and by that I mean close and careful attention. Let the story (each and every one) speak directly to you. While reading it, take your time, go slowly-and never, ever, ever, read this at night with the lights turned down low-and never in front of windows!Mr. Norris is also featured in “Evil Jester Digest Volume One,” as well as many other publications. In this collection of short stories, Gregory's muse takes us to places as diverse as ancient Egypt to your own back yard. 26 tales, each one unique in it's telling and yet there are a few stories which share similar geography. Highway 101 is a stretch of road I wouldn't want to find myself traveling on a dark and lonely night.The author is skilled at creating believable situations and has a real talent for conversation. Sure there are monsters, of both the nightmarish and human kind, but I had no trouble suspending my disbelief long enough to enjoy a good story.There are some proof-reading issues. Not a lot, but enough of a distraction to keep me from giving the book 5 Stars. For example, using through for though, and in another story, a character says, "You know we keep all of them.." when it is evident the writer meant to say, "...we CAN'T keep all of them...".But for creativeness and storytelling, it's tough to find a better collection than what Gregory L. Norris and Evil Jester Press has put together in The Fierce and Unforging Muse. Available now in paperback and for the Kindle at Amazon.com. Once inside this dark anthology, a few stories deep, the author tells us, "The average dream lasts twenty minutes. Some nightmares never end." That aphorism eventually sheds its cleverness, however, and takes on the starker dimensions of a warning; a placard cautioning the reader that to proceed is to risk the soundness of mind. From the first story, "Storage", about one man's stored possessions having nurtured something more than just nostalgia, to the incredible horror that idles inside the night lot in "That Dead Car Smell", then onward to the macabre obsession of "The Menagerie", there is never a place to pull over and find rest in Gregory L. Norris' The Fierce and Unforgiving Muse. And there runs within this collection of twenty-six stories a piquant undercurrent of isolation, of loneliness, deep and murky, wherein the reader gradually begins to experience the separation of the truly beguiled. This is horror at its very best and bleakest, and it is in fact one of the best collections I've read in quite some time. This is a must have read. Gregory is one the most talented writers around and this collection of stories, all wonderfully original and with a twist that is typical of Gregory Norris' skill as a writer of fantastic tales and a unique mind. If you are making a list of must have books, make sure that this is top of that list.